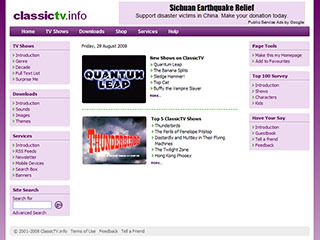 ClassicTV is an information source for classic television programmes. The new design features a fixed width page centred within the screen. The colour scheme is similar to before, but with photo icons to aid site navigation. Functionality has been improved within the Catalogue section, which has now been streamlined and renamed TV Shows. The Services section has been upgraded, and a new Users section has also been added.